Faith Slater became aware of the positive effect she could have on people’s lives when she started working as a carer in a residential home and in the community 18 years ago. Ms Slater says: ‘It was all about the patient and it meant so much to be able to brighten their day and give them what they needed, particularly people in their own homes, as sometimes you are the only person they see for that day and talk to. Four years later Ms Slater got a job as a healthcare assistant (HCA) at St Wilfrid’s Hospice in Chichester, and spent three years there learning the fundamentals of caring. ‘It was a unique opportunity early in my career. It was all about getting the basics of nursing care right and looking at a patient’s spiritual needs. Every healthcare professional should have a chance to practise the basics early in their careers. Ms Slater says the hospice ensured all staff had plenty of training days including information about the latest developments in end of life care, privacy and dignity and conflict resolution. Ms Slater says a family support team of social workers and chaplains also worked with the HCAs and nurses to give the best possible care. 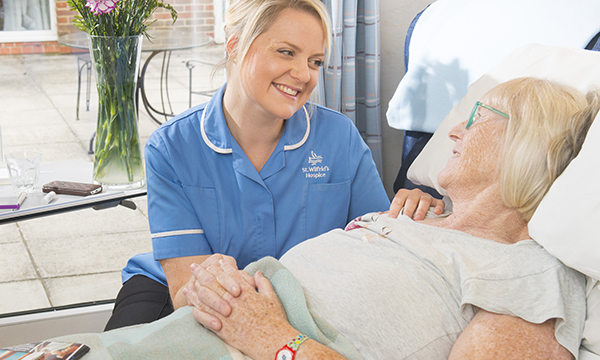 Managers at the hospice felt Ms Slater could continue her development through nurse training, although she had to be convinced. Ms Slater persevered and achieved the necessary qualifications to study nursing at university: ‘I qualified in March 2014 with a first-class degree in adult nursing. I was elated. I immediately got a job on an acute medical unit at St Richard’s Hospital, Chichester. ‘It was a huge shock to go from being a nursing student and then working on a busy ward. But I was able to put everything I had learned into practice. It was so different to being a HCA or working in palliative care. Ms Slater went on to get a specialist community public health nurse diploma and worked as a health visitor: ‘I had gone from end of life care with older people to working with babies and young families. It was an amazing year; however, I did spend a lot of time on the phone to social services and in safeguarding meetings. At the end of last year Ms Slater went to work at a nursing home and realised how much she loved end of life care: ‘I looked after an older man and we were able to get on top of his symptoms with pain relief. We liaised with the GPs to get the right prescriptions. Ms Slater went back to St Wilfrid’s Hospice on one of her days off and found out there was a staff nurse job on offer. ‘I couldn’t believe it, I applied for it immediately and got the job. ‘I will admit that going back to the hospice, there was an element of feeling different. I had looked up to these nurses for years and realised – I am a nurse now. I was welcomed with open arms and I’m totally supported in my role. The hospice has its own education centre and offers courses on topics such as compassion awareness, building confidence and communication. NHS trusts take part in some of the training courses and the centre also offers a selection of courses to complementary therapy professionals to further develop their competence. St Wilfrid’s, which has been providing care for the local community for 30 years, is running a Sponsor a Nurse campaign where members of the public can donate any amount to sponsor a nurse working for the hospice. Ms Slater says: ‘St Wilfrid’s is building a new site as it has outgrown the existing building. It is an exciting time. There is a good staff to patient ratio and you do still get to spend quality time caring for your patients. ‘It is a privilege to look after all these amazing people. Every day I feel so lucky, they have had careers and done amazing things, a lot of them still have a sense of humour even though they have been through so much. ‘It makes you appreciate what you have, and how important it is to live your life to the full because you don’t know how quickly things can change. I learn all the time from patients.